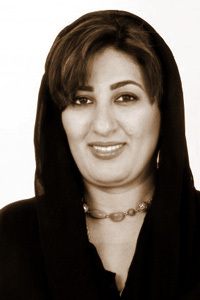 Nujoom Al Ghanem, both a poet and a prize–winning filmmaker, was born in Dubai, United Arab Emirates. Following a career as a journalist for the Abu Dhabi newspaper Almaraa Alyaum , she earned a degree in television production from Ohio University and a Master’s degree in film production from Griffith University School of Film in Australia. Her seven poetry collections include Layloun Thakilon Alla Allayle [ Heavy Night on the Night ] (2010), Malaikat Al-Ashwaaq Al-Baeeda [ Angels of Distant Longing ] (2008), La Wasf Lima Ana Feeh [ No Describing What I Am In ] (2005), Manazel Al–Jilnaar [ Homes of Pomegranate Blossoms ] (2000), Rawahel [ Journeyings ] (1996), Al–Jarair [ The Sins ] (1991), and Masaa Al–Janah [ Evening of Heaven ] (1989). Alghanem has also made multiple documentary films, including Hamam (2010), Between Two Banks (1999), and Al Mureed , winner of the Best Documentary in the Gulf from the 2008 Emirates Film Competition.